Luas Cross City will result in a large number of traffic restrictions and little is planned to accommodate cycling, at least away from the College Green area. This was confirmed this week in answers given by the Luas Cross City project team to IrishCycle.com. The answers detailed below in full range from narrowing of an already narrow cycle lane outside a Luas tram stop on the North Circular Road to no provision for contra-flow cycling on key city centre streets which Dublin City Council previously had planned for contra-flow cycle paths and no provisions to allow bicycles to be cycled where there will be new turning restrictions or one-way streets. The city’s development plan looks for contra-flow cycling to be provided where it is possible, but so-far there’s no indication this is to be followed even for wider streets with space or where there would be long detours for cycling. Parnell Street at south end of Parnell Square and the north west corner of St Stephen’s Green were part of a 2010 Dublin City Council proposal for contra-flow cycling, but no attempt to date has been made to provide these key cycling links as part of the Luas works. At St Stephen’s Green, while photomontage images and some of the drawings show what seem to be a fully pedestrianised area around St Stephen’s Green North between Dawson Street and Grafton Street, and the drawings indicate “loading vehicles only” access, the Luas team told us that their current plan is to provide the before construction traffic flow arrangements without contra-flow for cycling. “The currently proposed Luas Cross City design includes an eastbound shared general traffic lane on St. Stephen’s Green North from a point just east of Grafton Street to Dawson Street. A shared westbound/southbound general traffic lane is also included from Dawson Street junction, linking to Glovers Alley,” said Mackin. On O’Connell Street Upper northbound the right turn onto Cathal Brugha Street is to be removed and no provision is to be made to allow people on bicycles to make this turn. The junction of Dawson Street / Molesworth Street will be made one-way, so that traffic will not be able to exit Molesworth Street and turn right onto Dawson Street northbound. This is because general traffic will not be able to proceed to the north section of Dawson Street. Cycling will be allow on the north section of Dawson Street but the junction at Molesworth Street is not planned to accommodate cycling in this direction. At Dominick Street Upper, Western Way and Palmerston Place the plan is to close off all but Luas and walking access to/from Dominick Street. The photomontage images and some of the drawings show what seem to be fully pedestrian area around St Stephen’s Green North between Dawson Street and Grafton Street and the drawings indicate “loading vehicles only”… Could you please confirm the general design of the section of St Stephen’s Green North covered under the railway order, and cycling will be provided for in any direction? Luas Cross City reply: The currently proposed Luas Cross City design includes an eastbound shared general traffic lane on St. Stephen’s Green North from a point just east of Grafton Street to Dawson Street. A shared westbound/southbound general traffic lane is also included from Dawson Street junction, linking to Glovers Alley. 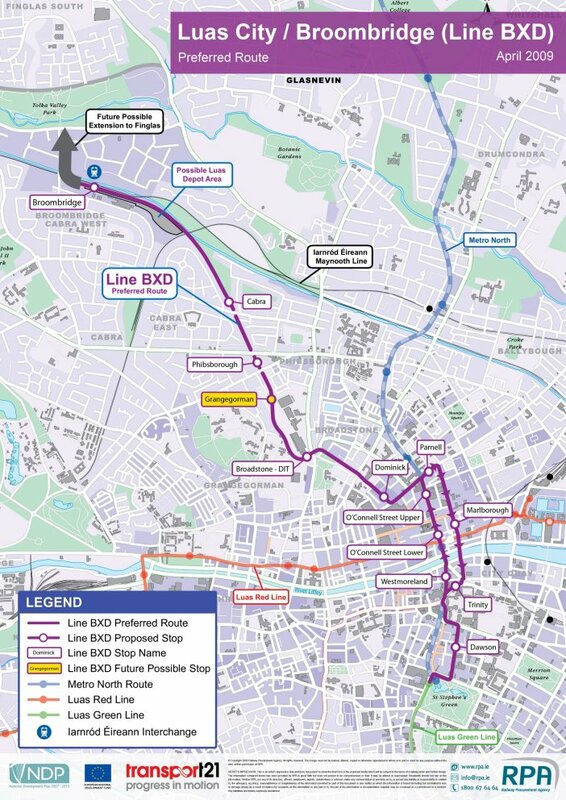 As with the Luas red line and the city centre section of the Luas green line, the Dawson Street southbound Luas tracks (tram only sections) will create a strong cycling desire line which is safer and shorter than the current alternatives — what measures (such as improving alternative route, barriers etc) is planned to dissuade use of these tram-only sections? Luas Cross CIty reply: It will be illegal to enter the Dawson Street southbound tram lane from Nassau Street, Molesworth Street, Anne Street South and Joshua Lane. Cyclists egressing the local area will be permitted to use a shared section of track from Dawson Lane/Duke Street to get to Molesworth Street, where they will legally have to turn left. In addition, sections of Dawson Street that are ‘tram-only’ will have a rough granite surface. The National Transport Authority Greater Dublin Area Cycle Network Plan (December 2013) sets out the proposed cycle network for Dublin City Centre. The railway order drawings shows a note says north of Duke Street on Dawson Street is for “public transport and restricted access” — could you please confirm cycling will be allowed past this point? Luas Cross City reply: Cycling will be allowed past this point. The Railway Order drawings shows the Dawson Street entrance to Molesworth Street changed to one-way for all traffic (ie traffic is not allowed to exit Molesworth Street and turn right onto Dawson Street northbound). Could you please confirm if there will be a cycling exception to this and, if not, why not? Luas Cross CIty reply: The currently proposed Luas Cross City design does not allow for a cycling exception to one-way traffic on Molesworth Street. Note: I’m not asking questions about this area as it’s subject to public consultation. Luas Cross City reply: The currently proposed Luas Cross City design includes a right turn bus lane from O’Connell Bridge to Eden Quay. Cyclists would be facilitated in this lane. In addition, it is envisaged that the Liffey Cycle Route scheme will enhance cycling movements at this junction. Could you please confirm of the existing cycle lane will be repainted, improved or removed? Luas Cross City reply: The currently proposed Luas Cross City design includes an advisory cycle lane on O’Connell Street Lower, northbound. This area has previously hosted a significant amount of bicycle parking — Where if any place will this be relocated to? Luas Cross City reply: Details of additional cycle parking have not been finalised. Will there be any provision to allow people to cycle from O’Connell Street Upper to Cathal Brugha Street without dismounting? In the current plan there is no means of turning right between Fleet Street and the north end of Parnell Square. Luas Cross City reply: There will be no right turn from O’Connell Street to Cathal Brugha Street, but there will be a right turn from O’Connell Bridge to Eden Quay. Parnell Street at south end of Parnell Square was part of a 2010 Dublin City Council proposal for contra-flow cycle proposals — Could you please confirm if such contra-flow provision is being provided in the final Luas Cross City plans? Luas Cross City reply: The currently proposed Luas Cross City design does not include eastbound contra-flow cycling on Parnell Street between Parnell Square West and Parnell Square East. Will the existing cycle lane in this area be replaced, improved or removed? Luas Cross City reply: The currently proposed Luas Cross City design includes an advisory cycle lane. Is there any provision for cycling planned in any direction on Dominick Street? Luas Cross City reply: Dominick Street will operate one-way southbound from Palmerston Place to Parnell Street, with some sections shared with Luas. Cyclists will share the lane with general traffic. Dominick Street is not included as a primary, secondary or feeder route in the National Transport Authority Greater Dublin Area Cycle Network Plan (December 2013). The railway order plan is to close off access here: is there any later plan or proposal which will allow for a two-way cycling link between Western Way and Palmerston Place? Luas Cross City reply: The currently proposed Luas Cross City design does not include a two-way cycling link between Western Way and Palmerston Place. Could you please confirm if the railway order drawings are being followed exactly re footpath widening or not, both on the North Circular Road and Cabra Road? Luas Cross City reply: The currently proposed Luas Cross City design follows the railway order drawings. While there are restrictively narrow sections of the Broadstone to Broombridge railway cutting: it should be possible to include a walking and cycle route between Cabra Road and the Royal Canal and Broombridge… Is this actively under consideration or is there any planning even to allow for a future walking or cycling paths along the route described? Luas Cross City reply: The currently proposed Luas Cross City design does not include a walking and cycling route in the cutting. However, the section from Broadstone to Cabra is included as a possible future greenway in the National Transport Authority Greater Dublin Area Cycle Network Plan (December 2013). The planning process for Luas Cross City preceded this plan. At Broom Bridge, the bridge west of Broombridge station and stop, the roadway at the bridge is currently one way, massively restricting cycling access to Broombridge stop from the area north of it, including Finglas. Is there any plan to change the traffic flow or allow for two-way cycling? Luas Cross City reply: This is a matter for consideration by Dublin City Council. Thanx Cian for eliciting these detailed responses. There are a number of areas we will have to closely keep an eye on! But overall, despite your article title, there are a great many positives! Luas in Dublin has sterilised many streets for cycling (basically a right-of-way has been expunged) and we know that there is a steady toll of injuries due to falls from bikes when front wheels get trapped in the flanges of the rails. TII has refused to place inserts into the open flanges at critical bike crossing desire lines. Our city is going to become an even more cycling-hostile place to be what with failure to deal with hazardous junctions, multi-lane one-way streets and gyratories and counter-flow provision. What cycling-related positives are you thinking of? Note: Above is not a full list of permeability and other impacts of Luas Cross City for cycling, the above article mainly focuses on where measures could be taken but there has been a complete failure to put in cycling friendly measures. For example, Marlborough St will also be made one-way sections where it is currently two-way. In many locations there will be closer sharing of space with buses with less or no space for buses to overtake cyclists safely (Dawson St, Nassau St, O’Connell Street, etc). And cycling around tram tracks with buses and taxis cycling behind you is not comparable to cycling around tram tracks in cities which have few buses and nowhere near as many taxis as Dublin. Lots locations where Luas is going in it will make it a lot harder to correct existing permeability and quality of service issues. Permeability issues on the north side of the city centre are already massive and not designing for contra-flow on Parnell Square and at the O’Connell Street junction will make it all the more harder and costly to go in and change this later. The above news article is mild and reserved compared. The headline is straightforward and factual. There’s few signs of cycling-friendly measures and many restrictions will apply to cycling — that’s not an opinion. The bicycle is a very simple means of transport, yet using it in much of Dublin city centre has become ever so complicated. Accessing and getting about, most especially on the Northside, since the Luas and now the cross city line is often far easier walking or even taking the bus. I would like to know what these positives are too. From a cycling point of views, there really doesn’t seem to be any. Unless I somehow missed them ? Many parts of the city centre one easy to get by bike are now off limits. Planning a journery more often than involves quite long detours and the return trip often not possible by the same route. How can more people be encouraged to choose the bicycle in Dublin, when those already cycling are being squeezed out in this fashion ? It makes no sense at all to disadvantage such a space and energy efficient mode, while space is still being allocated to on street parking and unnecessary multilane one ways whole main purpose seems to be facilitating motor vehicle capacity and use. What exactly is an “advisory” cycle lane. Is it one shared with vehicles, moving, parked, both? Advisory cyclelanes are indicated by dashed white lines. They mean nothing because they’re simply discretionary/advisory. You can park in them, drive in them, unload/load in them, have a party in them if you want as nobody will do anything. They’re worse than useless. In some cases they’re actually dangerous because they put vulnerable road users in dangerous positions. I’ve sent this email now four times to info@luascrosscity.ie, butr have not had a reply apart from an automatic one the first time. It’s not good! Is Luas determined to exclude cyclists from the City centre??? As I cycle through central Dublin now I see that the Luas works are entering their final phase. As part of these works, pavements and other pedestrian facilities are being finished. Nowhere along any of these roads do I see bicycle parking being installed. Since it strikes me as being a little disorganised to dig up lovely new pavements so as to install bicycle parking such as Sheffield racks, I am concerned that there might be no such plan. Today, for instance, on Dawson Street and adjoining streets I counted over 200 bicycles all locked to a variety of street furniture, some on bus stops – causing inconvenience to passengers using the stops – and many, many, locked to the temporary Luas safety fencing – an option that will soon disappear. May I ask, please, what are the plans for providing adequate and sufficient bicycle parking racks to replace and significantly augment that which was there before the Luas.